Hello, lovelies~ I know I raved so much about the L'Oreal Paris Double Extension Curl mascara, but I am always willing to try other mascaras, just for comparison. I bought Maybelline The Falsies earlier this month to try out. The mascara comes in a deep purple tube with the label on the sides. The size of the tube is similar to most Volum'Express mascaras from Maybelline. The mascara wand has a curved shaped almost similar to the Magnum (yellow tube), but curvier. It has natural bristles as opposed to synthetic, rubber ones. 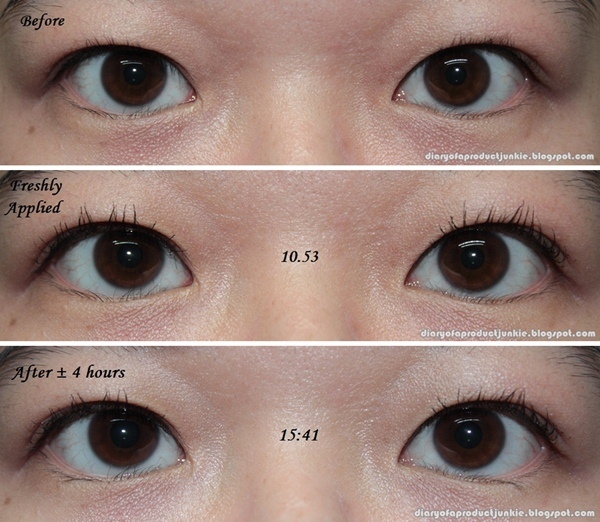 Half of the mascara wand is flexible up to a certain point. The formula of this mascara is more to the dry side, even if it looks slightly wet off the tube. I had no difficulties in applying this even all over my eyelashes. As for staying power, I would say they did an excellent job on my thin lashes throughout the humid weather of our lovely Jakarta. Sure it didn't look exactly like it was when it was first applied, but it did a pretty good job staying in place, being waterproof and all. Overall, this is quite close to my L'Oreal Double Extension Curl, but this has a lesser chance of clumping if applied in a hurry. Plus, this is more time saving because I don't need a base beforehand. Retailing at Rp 80,000, this mascara may be suitable for those blessed with thin and sparse lashes as it doesn't weigh down on the lashes, hence keeping its curls. g' ada beda tuh, matanya sepet si. Wah, Max Factornya jangan lupa direview yah, pngn beli yg itu td nya, cm pas ngelewatinnya Maybelline. Jadi kebeli dah yg the falsies. oti dijepit lagi pake penjepit bulu mata gak ci step?